I’m going to begin focusing on Gamay a bit over the next few months, because it’s an underdog grape that really intrigues me. So, here we go, with the first wine in this focus. [Actually, I may have to go back to the RPM Gamay I reviewed a few days ago and make that the first in the series. So this is Gamay focus, 2.] This is such a good wine. 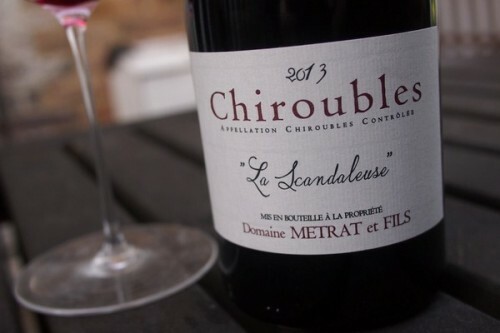 When I tried it, its vivid peppery black fruits made me think of the Northern Rhone. Well, it turns out that this wine was in previous vintages labelled as Cuvee Cote Rotie, which reflects its flavour profile but which is a bit naughty, so it had to be changed. Shhhh. Don’t tell anyone about Beaujolais. I drank Foillard’s “Cuvée Corcelette” 2011 last night. Incredible wine. I always keep a large stock of Cru Beaujolais at the house. I love the look of “Are you really serving Beaujolais to us?” from our friends. I had the chance to visit last month and while at Clos de la Roilette (another fantastic property), they made an interesting comment saying that the wines will change depending on the climate and wind patterns of a particular year. They will either get red fruit aromatics and elegance of Burgundy or more brash, black fruit gaminess of the Cotes du Rhone.